The TSO Eyeglass Guide Provides Eyewear Suggestions Tailored To You! I had a good experience every year I go in. Doctor and staff is so nice and very helpful! Thorough, efficient and very friendly! Couldn't ask for more!! The doctors and staff are very friendly and courteous. From making the appointment to picking up my contacts, every person I came into contact with was helpful and knowledgeable. Dr. Tran always makes sure you understand your exam results and takes the time to answer any questions you may have. I've been going to this location for many years and have always had consistently good service! Staff was knowledgeable and invaluable with their input in helping me select frames. My parents went not to long ago. They said they had an awesome experience. Everyone was nice, friendly, knowledgeable and made my parents feel like at home. They went to a different place last year and they where very unhappy. Thank you guys for helping my family. Now I'll be setting appointments there soon. Thank you keep up the good work. We just moved to the area and needed to see someone quick. The sfaff and Dr.'s were super friendly. The Dr. explained things to my son so he understood what she was talking about. I have been coming here for years now. Dr. Tony Tran is very professional and very knowledgeable. The staff is always pleasant. I recently went in and I was assisted by Alicia Perez, she is full of energy, experience and made sure that any concerns were addressed. She's an asset to TSO. 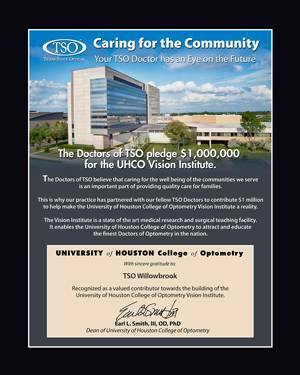 I highly recommend this TSO office and staff. I've been going here for many years. They get me in out very quickly. Thanks for your excellent service, Dr. Tran! I have been going here for many years and have always been pleased. I have seen both doctors, which are both knowledgeable and friendly. The staff is very friendly as well. I absolutely recommend them! Dr Tony Tran was very good. He took the time to answer all of my questions. He explained the scan of my eye in great detail. He was very personable, friendly and professional. They staff was friendly and very informative.. They answered all my questions dumb ones too. Dr. Tran combines high-tech equipment to monitor eye health with a cordial, professional and knowledgeable staff. Good selection of eyewear frames & lenses, and costs were clearly explained. Completely satisfied with TSO @ Willowbrook manger Alicia went beyond our expectations by taking care of our problem with glasses that were recently purchased. Awesome customer service! second to none. Awesome service and had no wait. The doctor and people there were very informed and helpful! Will definitely go back here if I'm still close to this area!! I've gone here for years and will definitely continue! I recently went in and the two young women were very patient with me and helped me pick my new frames. And the young man at the front desk was very attentive and welcoming. Very pleased with my experience every year. Great Doctors and a very thorough eye exam. The Dr took the time to explain the results of the exam to my understanding and also laid out a plan for taking care of my eyes in the future. As far as shopping for frames, the salesperson seemed a bit distracted and just pointed me to the wall. I looked through the frames and found the selection to be nice. I'm a big guy so the selection of frames for guys who need larger frames was great. Haven't received my glasses yet so I will update as I get them. I would recommend this place for the Doctors, testing, and selection of frames. I found my experience with TSO Willowbrook pretty good. First of all I am in the medical field so I am a very tough critic when it comes to customer/patient service. The exam was more informative than I've every had and you can tell the Dr. takes pride in his profession. The appointment was speedy but not rushed. The staff was friendly and genuine and Regina seemed interested in help select glasses for myself and kids. The only thing that was a little off is the fact that she seemed to be trying service more than one patient at a time,but again I'm in the medical field and it was the end of the day so I'm assuming she was the late stay with a few more appointments. The overall experience was great. I've been going to TSO Willowbrook for years. The staff is friendly and very knowledgeable. Dr. Tran is awesome! My boys and I like how nice he is. I was very satisfied with the service and the doctor was open and honest. Very happy and will send my Mom next. Tso has taken care of everything. My wife is thrilled with how she was taken care of and treated. Clearly the team at tso went well beyond what was expected. I am very pleased with the outcome and will be shopping there in the future. Dr. Tran & the staff are very friendly & not pushy. I enjoyed my visit. Dr. Dang was very friendly. We usually see Dr. Dang and we love him, but I was a walk in and Dr. Tran was who was in to see me. They were fast and he was great, too. Both doctors are awesome. VISIT WAS AWESOME! Lady who initially checked my eyes was GREAT! Dr. Tran was PHENOMENAL! Ladies at front desk were professional and friendly! Timely service as well! I love Dr. Dang and Dr. Tran. Both are great and very helpful when it comes to understanding your eyes. My family has been using them since we moved to Texas 10 years ago. They are fast and great with maximizing what your insurance covers. We have two different ins. for eye exams and they use both. One has great frame coverage, the other has great lens coverage and a cheaper co-pay. They used both, giving me the best deal on my glasses.